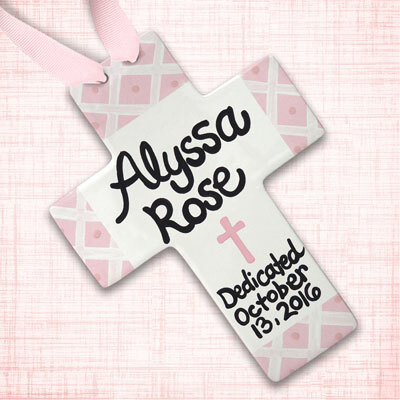 Navigate: StoreFront / Gifts for Christian Occasions / Baptism Gifts / Baby Baptism Gift Ideas / Baptism Crosses / Personalized Pink Squares Baby Baptism Wall Cross - 10"
Celebrate your special little one with this sweet ceramic cross!!! 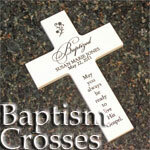 Among most cherished keepsakes, this cross will always be a small reminder of baby's special day. This is a permanent, high quality keepsake. All pieces are hand painted by Kathleen Virtue, the artist. She starts with bright white bisque cross. She then uses teeny tiny brushes to paint each cross with her original artwork. Next each cross is finished with a lead free, clear glossy glaze. The crosses are kiln fired for 6 hours at 1888 degrees. The final product is a permanent, high quality keepsake! !